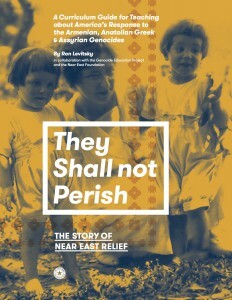 booklet on America’s response to the Armenian Genocide, through the work of the Near East Relief foundation. NER workers courageously bore witness to the genocide and fed, clothed, and provided medical treatment to thousands of refugees. Near East Relief is credited with saving over one million lives between 1915 and 1930, including 132,000 orphan children, in what was the largest international humanitarian effort up until that time. This publication may be used as a stand-alone teaching tool or in conjunction with They Shall Not Perish: TheStory of Near East Relief, a downloadable exhibition created by the Near East Foundation. The history of America’s Response to the Armenian, Anatolian Greek, and Assyrian Genocides can be taught in conjunction with units on World War I, Holocaust and genocide studies, international relations, civic engagement, and philanthropic history.